24 cyclists are set to embark on the 2018 Amy’s Share the Road Tour, riding almost 800kms from Wodonga to Melbourne via the Alpine peaks of Falls Creek, Mt Buller and the Yarra Valley, raising funds to support the work of the Amy Gillett Foundation. Starting on Sunday, the 6-day fully supported Tour will finish at the Melbourne Town Hall at 2:30pm Friday 16 November, where Tour participants, friends, family and supporters of the Amy Gillett Foundation will be greeted by Lord Mayor Sally Capp. The Amy Gillett Foundation will present its top 5 safety priorities for Victoria, including the importance of the incoming Victorian government to catch up with the rest of Australia and introduce a metre matters laws without further delay. Victoria remains the only Australian State or Territory yet to implement this life saving measure. The 2018 Share the Road Tour will be led by Australian cycling royalty Phil Anderson, together with Belgium pro-cyclist Rudy Rogiers and Australia rising star Grace Brown, the 2018 Amy Gillett Cycling Scholar, fresh from success on the international circuit. This annual Tour rides under the banner of ‘Share the Road’, spreading vital cyclist safety messages, including a metre matters and the importance of mutual respect and responsibility between cyclists and drivers. 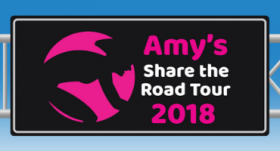 As well as a major fundraiser for the Amy Gillett Foundation, the Share the Road Tour has been instrumental in raising awareness of the importance of a metre matters (minimum passing distance) laws across Australia and the need for drivers to safely pass cyclists on our roads. This year’s Tour profile is significant, rivalling the Tour de France with almost 13 vertical kms of climbing. This will require a huge effort from the riders and will add to the allure of completing such an epic cycling adventure. With 34 cyclists tragically killed on Australian roads already this year, and over 9,000 serious injuries, the Share the Road Tour aims to raise more than $100,000 for the Amy Gillett Foundation and increase safe cycling awareness across Victoria. Tour participants will visit five (5) schools along the route to discuss safe cycling and the work of the Amy Gillett Foundation with the students and teachers. These are very interactive sessions and provide a great opportunity to engage with our young minds. The 2018 Share the Road Tour is supported by Foundation Partner Toll Holdings, Share the Road Tour Event Partners Wiggle & Volvo Trucks, and Event Suppliers Europcar and Sub4. Safely passing cyclists on our roads is easy – slow down and pass with a minimum of 1 or 1.5m. Do not pass until you can pass with this space. Waiting a moment or two longer won’t kill you but it may just save the life of the cyclist you’re about to pass – it’s that important. Make safe cycling your priority this election – the Amy Gillett Foundation’s sole focus is on actions and policy that help to achieve a safe cycling environment in Australia – join us by making safe cycling your priority this election – visit amygillett.org.au/election to see our priorities and take action.